In 1841 Richard Wagner was in Paris, fleeing creditors in Riga and hoping to make some money. One of his schemes was a one-act opera for the Paris Opera, to be performed as a curtain-raiser to a ballet. (A substantial one, the opera lasts nearly 130 minutes). So Wagner set to work on what would become Der Fliegende Holländer. He wrote the libretto and the music for Senta's ballad and some choruses. These were shown to the director the Paris Opera, who rejected Wagner's work. Musical Paris of the 1840's shaped by Meyerbeer, Auber, Halevy and Donizetti was a world away from Wagner's ideas. The Paris Opera did buy the synopsis for the opera from Wagner (he needed the money desperately) and whilst Wagner went on to write his opera anyway, the Opera had a French libretto created and given to Pierre-Louis Dietsch. Dietsch's opera was performed 11 times between November 1842 and January 1843, never to be seen again. Wagner's opera was premiered in Dresden in 1843. The rest, as they say, is history. This intriguing combination was hit upon by Mark Minkowski as a project to celebrate Wagner's bicentenary. 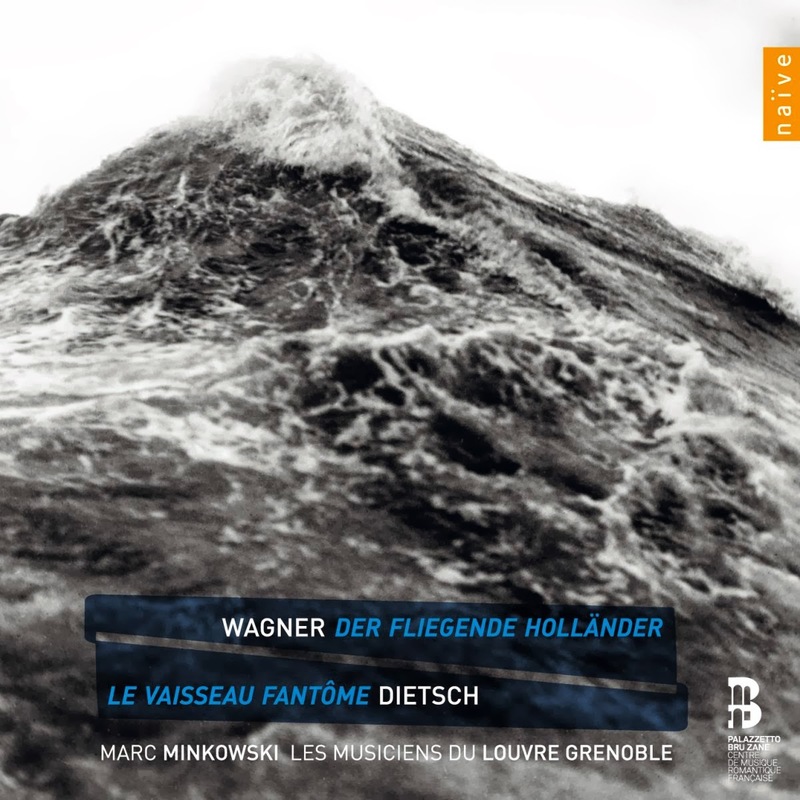 Minkowski and Les Musiciens du Louvre Grenoble performed both the Dietsch and Wagner's original 1841 version of Der Fliegende Holländer in concert in a double bill and recorded them in the studio in May this year. A fascinating combination of might have beens and what ifs. What if Wagner had written an opera for Paris in the 1840's! The version of Der Fliegende Holländer that Wagner wrote in 1841 was only marginally different from that performed in 1843. In Dresden he split the work into three acts but it was conceived as a continuous, humungus whole. It was only later tinkering which introduced the further revisions creating the version familiar today with the extended redemption theme at the end, with Tristan-esque moments which sit awkwardly with Wagner's earlier style. The first version of Der Fliegende Holländer is a more coherent work, if less rapturously rapt. Minkowski and his musicians (over 60 of them) grab us by the scruff of the neck from the very first notes of the overture to Der Fliegende Holländer. Minkowski takes a very dramatic view of the work, one which continues throughout the opera. He clearly relishes the distinctive timbres of the period instruments. At the opening the strings tremolandos are edgy and sharp toned without the benefit of vibrato, and the horns rasp, the woodwind is distinctively characterful. Minkowski take 9:34 for the overture which compares to 9:40 for Roger Norrington (himself no slouch) and the London Classical Players. Hearing the music on period instruments is something of a revelation, like having the varnish cleaned off an old master revealing brighter, different colours underneath. What the period instruments give us also is more space between the notes, their tone might be a bit sharper edged, less mellow, but there is more air between the notes. And that they can kick up a storm without overwhelming us with noise is something that Minkowski obviously enjoys. But in a sense this is a very modern recording. Just as the early period performances of Mozart's symphonies now sound a little dated, so I suspect that this recording will do so too. This is a very clean performance, there is no portamento at all. Instead Minkowski uses the instruments to reinforce the clarity of the music. When it comes to the singing, we are firmly in the 21st century. In common with most period practice performances, particularly of 19th century opera, there seems to have been little attempt to make the singers conform to 19th century styles. Whilst the instrumental players may well have sat down with early 19th century manuals to learn the techniques used by performers of the day, the singers certainly do not seem to have done the same. For a start, the bass Evgeny Nitkin is a renowned Dutchman in performances on modern instruments; he famously was not allowed to sing at Bayreuth in the new production of the opera. He has a weight of voice which is entirely modern and which, I suspect, would hardly reflect the type of voice that Wagner would have originally used for the Dutchman. Minkowski does not, here, seem to take advantage of the period instruments which would allow for a somewhat lighter voice. The use of period instruments in 19th century repertoire has revealed that voices do not need to be as big as they have developed in the 20th and 21st centuries. When casting Enee in Berlioz's Les Troyens John Eliot Gardiner used a rather lighter voiced tenor very successfully and his recent performances of Weber's Der Freischutz at the Opera Comique have continued this trend. When Wagner mounted Der Fliegende Holländer in Dresden it is worth bearing in mind that the heaviest roles that the bass would have been used to would be those in Beethoven's Fidelio and in Weber's operas. In 1843 the role was sung by a member of the Dresden company, Johann Michael Wachter (1794 - 1853) whose roles included Mozart’s Figaro, Sherasmin (Oberon), Mikéli (Cherubini’s Les deux journées) and Brian de Bois-Guilbert (Marschner’s Der Templer und die Jüdin),as well as performing in the premieres of three of Wagner's operas. When it comes to Senta, Ingela Brimberg is a mezzo-soprano who has moved up. Minkowski has successfully used her in roles such as Valentine in Meyerbeer's Les Huguenots, but for me her voice lacks the sort of bright ping which the ballad needs and under stress she exhibits a vibrato which is positively Callas-like. Something which would be acceptable in a modern performance, but seems anachronistic here. The original Senta, Wilhelmine Schröder-Devrient was a renowned dramatic actress and her roles included La Sonnabula, Norma, Fidelio, Der Freischütz, Die Zauberflöte, Euryanthe and Rossini's Otello, quite a catholic mix and not what a modern Senta would normally expect to perform. More successful is the Georg (as the Erik role was then named) of Eric Cutler who displays the sort of light spinto voice which the role needs. (You could well imagine him singing Max in a period practice performance of Der Freischutz). Mika Kares is equally successful as Senta's father Donald, with Bernard Richter as a lyric steersman and Helene Schneiderman as Mary. The Estonian Chamber Choir sing up a storm, and the scene with the Dutchman's crew interrupting the quayside celebrations is terrific. There will undoubtedly be further attempts at removing the varnish from Wagner's Der Fliegende Holländer and Minkowski's performance is more of a fascinating challenge than an ultimate performance. This is hardly a library set, but it deserves to be heard if only for the brilliance with which Minkowski articulates his forces and blows a wind through Wagner's opera. By contrast Le Vaisseau Fantome ou le Maudit des Mers is a far more sedate affair. Pierre-Louis Dietsch was the chorus master at the Paris Opera and in fact conducted the ill-fated Paris premiere of Wagner's Tannhauser. His opera (in fact his only opera) is firmly in the Meyerbeer/Halevy tradition, we can hear influences from Berlioz, Boildieu and Auber, it is clearly well behaved and in the mould of the French grand opera. The libretto is a long distance from Wagner's plot, in fact the articles in Grove's Dictionary of Music point out that the libretto for Dietsch's opera owes far more to Captain Marryat’s novel The Phantom Ship, as well as Sir Walter Scott’s The Pirate and tales by Heine, Fenimore Cooper and Wilhelm Hauff. The first night audience would not hear anything to shock them. Le Grand Boutique as Verdi called it, was open to all composers regardless of nationality, but notoriously conservative. After all Berlioz's genius, quirky and distinctive but firmly French, failed to enable him to get an opera performed there, so it is no surprise that Wagner failed. The first night audience at Le Vaisseau Fantome would would see nothing to shock them either. Despite the talk of the ghost ship, the sets were disappointing (the Opera was going through something of a financial crisis) and it is probably for this reason that the piece sank. When it comes to voices, Minkowski has stuck more to the sort of voices that Dietsch might have been expecting, so the result has a nice degree of style. Russell Braun is Troil, the Dutchman figure. Sally Matthews is a warm-voiced and appealing Minna (the Senta figure). Bernard Richter is her fiancee Magnus with a nice line in stylish top D's. Ugo Rabec is Minna's father Barlow. Eric Cutler reappears as Eric the secondary tenor role with Mika Kares as Scriften. The plot has acquired a number of diversions by way of influences of Sir Walter Scott and such like. It makes fascinating and enjoyable listening. Dietsch's score is some 25 minutes shorter than Wagner's (coming in at 105 minutes rather than 130 minutes), still quite substantial for a curtain raiser which says something about the stamina of the audiences in those days. Or perhaps they would simply have talked, gossiped and drunk their way through the piece, anticipating the main event, the ballet! The set is handsomely produced with a substantial booklet which fills in the background to both operas and to the various events in Paris that gave rise to them. I would, perhaps, have liked a little more detail as to exactly what Wagner changed in his various revisions of his opera. There are librettos for both operas, in English, French and German, along with photographs of the recording sessions. This set is a valuable confluence of different influences, with a performance of Wagner's first major opera in a performance which reveals the score, or at least the instrumentation, in a wonderful new light. By contrast Dietsch's well-made but rather polite piece will never be mainstream, but helps to illuminate a fascinating moment in Wagner's career.